Dressing up and performing the role of circus director, at the same time providing New Zealand Sign Language narration as part of the community circus show, Circolina’s Leap, was a new challenge for Auckland art therapist Rachel Coppage. However, it was a challenge she accepted because she wanted to be a role model for Deaf children, including her 11-year-old daughter, Meghan, who participated in the circus workshops and show. Circolina’s Leap, a partnership project between Circability Trust, Giant Leap Foundation and Toi Ora Live Art Trust, was recognised by Arts Access Aotearoa when it was presented the Big ‘A’ CQ Hotels Wellington Community Partnership Award at the Big ‘A’ Awards 2013 in Parliament on 30 July. The project included 12 weeks of workshops and culminated in two sell-out performances at Pumphouse Theatre in Takapuna. There was also an exhibition of photos by Karen Abplanalp capturing the rehearsal and performances, along with a DVD of the project produced by Toi Ora. The project involved more than 50 people of all ages (from four through to 60), abilities and artforms (music, theatre, circus, visual arts, film). People from the Deaf community interacted with hearing people, with mental health service users, people with physical or intellectual disabilities, young people, and people from the wider community. Frances Kelliher of Circability Trust says that developing collaborations and partnerships can sometimes take a long time and be hard work. “But with this partnership, the synergies between the diverse groups made it fun and effortless. There was a real freshness in the way people worked together. “Collaboration with Toi Ora gave us access to an established creative community whose commitment to our work was quite astonishing. The involvement of their musicians, artists, actors and film crew bought new ideas to every workshop session. 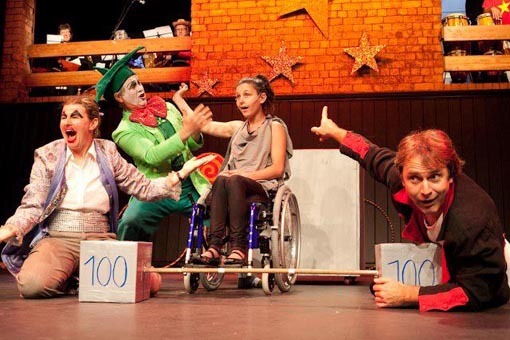 For Rachel, playing the role of a circus director meant that Deaf audiences could focus solely on watching the show rather than having to switch between the show and an interpreter at the side of the stage. David Grierson – performer, writer, director and printmaker – has been attending Toi Ora Live Art Trust since 2006 and was one of the clowns providing slapstick and comedy routines in between the circus acts. “It was very refreshing and exciting to be part of something that was so inclusive and accepting of difference,” he says. Strongmen Zeke Kennedy and David Grierson (above), members of Toi Ora's acting ensemble pulling their weight at Auckland Community Circus' Circolinas Leap. The performances were evaluated as part of a two-year research project called Developing Community Circus in Aotearoa New Zealand. Findings showed that audience members rated the show highly for its quality and professionalism, inclusive approach and the enjoyment of the performers. Most audience members (79%) said the show had a positive impact on their view of disability. “It was inspirational. We were mesmerised throughout the show. I was absolutely blown away and moved,” wrote one audience member. One of the groups involved in the project were people with intellectual disabilities who attend Hohepa Auckland. Silke Carter, Development Director, says the Circolina’s Leap project broke down barriers and provided active links to the wider community for the participants. “There are invaluable opportunities for self-development and personal growth for anyone involved in this circus programme,” she says. “For many of our participants, it was a huge confidence boost in both social and physical skills. Building on the success of the project, the partners are now working with Hohepa Auckland to create a community circus programme in Victoria Park. For more click here for the Arts Access Aoteoroa page about this year's awards. Original generation time 1.0034 seconds. Cache Loaded in: 0.0350 seconds.